After spending a reasonable amount of time with the latest DLC for Battlefront, dubbed Death Star, we are now in a position to give our insights into this DLC. In short, the Death Star map is something that fans of Star Wars have been waiting for since the arrival of Battlefront late last year. As mentioned in a preview of it earlier in the week, the DLC has three main parts. The first, known as Battle Station, is a three part mission which actually encompasses the other two parts of the DLC. The Droid you’re looking for. Battle Station sees you in the first wave either protecting a Star Destroyer if you’re on the Empire side, or destroying it if you’re a rebel. This in some ways feels very familiar to the Battle of Endor from Rogue Squadron 2 tasks you with taking down a Star Destroyer. This isn’t necessarily a bad thing, it was an amazing mission over ten years ago and it’s nice to play a game which has a similar mission all of these years down the line. Afterwards, you’re moved into the Death Star itself to prevent the rescue, or bring about the rescue of an R2 unit. Perhaps it has the technical readouts of the battle station… This can be a pretty hectic mode, in part because the nature of the Death Star is that it has tight and winding corridors. In some ways this is great since there isn’t a lot of room for campers, but depending on how trigger happy others are with explosives, it can be a recipe for disaster. Lastly, if the rebels are able to get R2 to the end point to get him out of there, the fight over the Death Star begins. This is much like the battle over the Star Destroyer in that it is an all out dog fight between the Rebels and Imperials. During this, certain players will also be chosen to start flying down a certain Death Star trench in order to fire off some proton torpedoes since the shaft is Ray Shielded. The other two modes in the game are Blast which is already in the base game, but of course this time it is seen in the Death Star. Fighter Squadron of course makes an appearance too, again appearing in the base game but now you have the option of flying around the Star Destroyer or over the Death Star and in its trenches. It’ll be interesting to see how many people opt to play Battle Station mode when they realise that they can simply play the maps in the other two game modes. Having said that, Battle Station is a really cool way to add a bit more depth into this game. The overall excitement of Death Star can’t be stated enough. 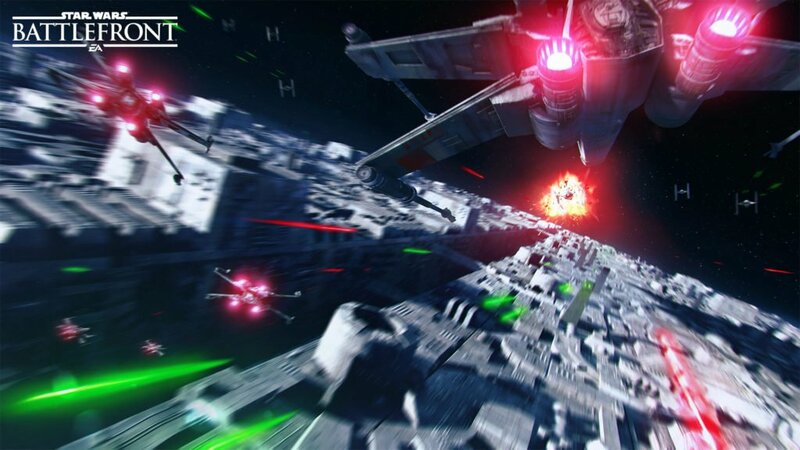 This is something every Star Wars fan has been waiting years for and the fast paced dogfights are a dream to play. Of course, there is also the addition of the mighty Chewbacca as well as Bossk into the game as well, which adds an extra layer of depth to it since they are both immensely powered (as you’d expect from Hero’s in the game). Graphically, the game looks amazing. Flying in space looks as great as it could be, and it is a faithful, if not better, recreation of the space fight scenes from the movie series. Playing on the PC with GTX970M, it is possible to crank all of the settings up to max and still play comfortably at over 60fps. At this time we’re unable to make a comment about the PS4 and Xbox One versions, but considering how well Dice have tweaked the Frostbite engine, we’re sure it’ll look amazing on these platforms too. This is the best looking set of maps so far in Battlefront, and dare we say it, the most fun. The music adds to the overall atmosphere too, with you feeling like you’re actually reliving the movie which is a nice treat considering how terrible other Star Wars games have been. Battlefront Death Star really is the best bit of DLC available so far for Battlefront and it’s just a shame that it took so long for it to arrive for the game. It is available now as the Season Pass on PC, PS4 and Xbox One. You can get it from Amazon.com or Amazon.co.uk. Both pages will allow you to select which platform you’d like the Season Pass on, as well as letting you buy the game and Season Pass if you don’t already have it.